Alan Bjerga and Erik Wasson at Bloomberg yesterday report that a bi-partisan agreement in the Senate Agriculture Committee this week preserves key parts of the First Lady's school nutrition goals, while still allowing all sides to claim victory. After half-a-decade of trying to dismember Michelle Obama's signature effort to make school lunches healthier, Republicans compromised with Democrats to preserve much of what the first lady wants while loosening rules in ways that benefit major food companies. "School nutrition policy can't thrive with just part of the country behind it," said Parke Wilde, a nutrition-policy professor at Tufts University in Boston. "Even if some of the compromises were painful, it seems hugely beneficial for the kids involved to have bipartisan legislation moving forward. This still is better off than where we started." To give some background for this viewpoint, here is a commentary that a Friedman School graduate student, Mary Kennedy, and I contributed to Choices Magazine a few years ago. Characterizing the School Food Authorities that actually serve the meals as businesses, we considered the conditions that would allow these not-for-profit businesses to provide healthier school meals without going broke. We argue, as do many others, that serving healthy meals through the federal meals program may require policies to address less healthy food from other sources in the school environment. A key part of the politics behind the Senate compromise this week was support from the School Nutrition Association (SNA), which serves in part as a trade association for the School Food Authorities. 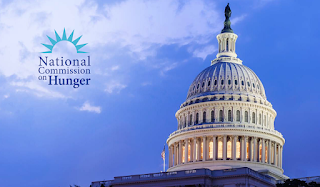 The SNA had concerns about previous child nutrition reauthorization proposals, but -- when its concerns are addressed -- may yet be a source of political support for policies that preserve improvements in nutrition standards. In the long run, it would undermine the SNA's reputation and political influence if it were considered a more fundamental opponent of policies to improve the nutrition quality of school meals for America's children. "Simultaneously offering healthy meals that are highly desired by kids, at a low price, while meeting school-nutrition standards is challenging. This is a truce rather than a final peace," he said. "But a truce is still pretty good news." The federal government's Dietary Guidelines for Americans 2015 were released this morning. This official publication of the Departments of Agriculture and Health and Human Services will offend nobody. 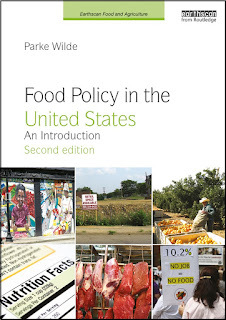 Certainly, any student of food policy can appreciate why its authors made the decisions they made. The departments are under intense pressure from Congress, and an official document of this type necessarily reflects a broad and inclusive area of common ground. The Washington Post headline says the new guidelines mean, "go ahead and have some eggs." Marion Nestle observes that the guidelines use "protein" as a euphemism for "meat" and "added sugars" as a euphemism for soda. Although the guidelines do include a phrase about "decreasing intakes of meats, poultry, and eggs," especially for men and teen boys, they exclude all mention of environmental sustainability, thereby avoiding considerable controversy. The Washington Post article gives the final word not to a nutrition scientist but to Nina Teicholz, a journalist and low-carb author who is on the board of the Nutrition Coalition, which lobbies for changes to federal dietary guidance. The coalition will have little to complain about in the official 2015 guidelines. If you place less value on political common ground and more value on sharpness, detail, and authority of scientific evidence review, breadth of topic coverage, and basic writing with vigor, don't be distressed that official departmental guidelines are not really the place to find such virtues. You may continue to read and cite the earlier unofficial external Dietary Guidelines Advisory Committee report for years to come. Expand access to healthy, safe, and affordable food choices that align with the Dietary Guidelines and provide opportunities for engaging in physical activity. In addition to that sound recommendation in the official guidelines, I will continue to read a related passage from the unofficial Dietary Guidelines Advisory Committee report. It will take concerted, bold action on the part of individuals, families, communities, industry, and government to achieve and maintain healthy dietary patterns and the levels of physical activity needed to promote a healthy U.S. population.This will entail dramatic paradigm shifts in which population health is a national priority and individuals, communities, and the public and private sectors seek together to achieve a population-wide “culture of health” through which healthy lifestyle choices are easy, accessible, affordable and normative—both at home and away from home. In such a culture, preventing diet- and physical activity-related diseases and health problems would be much more highly valued, the resources and services needed to achieve and maintain health would become a realized human right across all population strata, the needs and preferences of the individual would be seriously considered, and individuals and their families/households would be actively engaged in promoting their personal health and managing their preventive health services and activities. Health care and public health professionals would embrace a new leadership role in prevention, convey the importance of lifestyle behavior change to their patients/clients, set model standards for prevention-oriented activities and client/employee services in their own facilities, and manage patient/client referrals to evidence-based nutrition and comprehensive lifestyle services and programs. Communities and relevant sectors of our economy, including food, agriculture, private business, health care (as well as insurance), public health and education, would seek common ground and collaborations in promoting population health. Initiatives would be incentivized to engage communities and health care systems to create integrated and comprehensive approaches to preventing chronic diseases and for weight management. The new official guidelines are quite nice, but, in addition, the 2015 Dietary Guidelines Advisory Committee report will retain a place on my syllabus. What would it look like if Republicans and Democrats worked together to reduce U.S. hunger? What would federal policy look like if Republicans and Democrats worked together to reduce U.S. hunger? It would probably look like this new report released yesterday by the bipartisan National Commission on Hunger. The membership really would be bipartisan. The commission included leading people nominated by the GOP-controlled House (3 Republicans and 2 Democrats) and the Democrat-led Senate (3 Democrats and 2 Republicans). The co-leaders included Mariana Chilton (a professor at Drexel University and director of the Center for Hunger-Free Communities) and Robert Doar (a Fellow in Poverty Studies at the conservative-leaning American Enterprise Institute). The diagnosis of the causes of hunger would include comparatively Republican themes (labor markets and broken marriages) and Democratic themes (injustice and lack of program access). The recommendations would honor the positive contribution of major nutrition assistance programs, while suggesting new measures to increase their healthfulness (including both incentives and -- notably -- a modest sugar sweetened beverage limitation) and their support for employment effort. Current anti-hunger policy is characterized by a massive gulf between program critics (treating legitimate anti-hunger functions as equivalent to government waste) and program supporters (treating even small proposed program changes as a matter of life-and-death). Clearly, this commission report is not written quite as a committed anti-hunger advocate would choose. Yet, I much prefer the anti-hunger strategy proposed by this commission to the current state of debate in this country.